I found this great set on Craigslist a few months back. It also included a long, low dresser as part of the set but I had to leave that one behind. 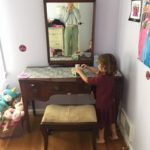 It had a huge mirror attached and the thought of bringing the dresser home and detaching the heavy and rather ugly mirror was too much. 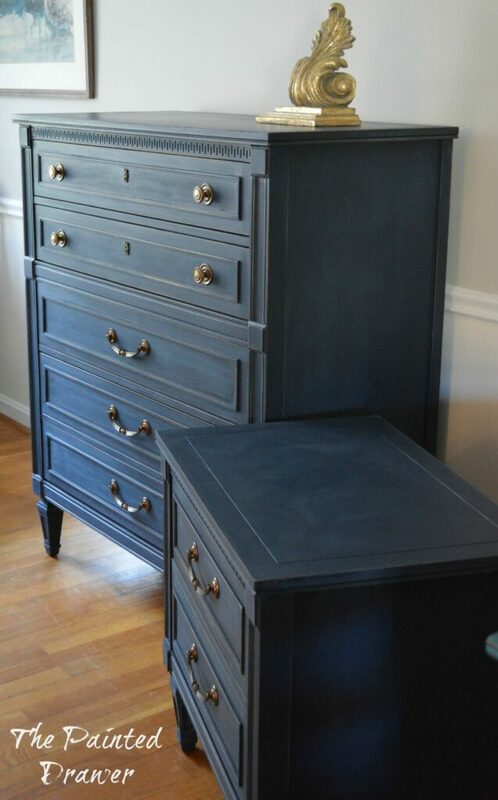 I settled on this great sized dresser with its sweet matching bedside table. The straight lines called for a sharp look. 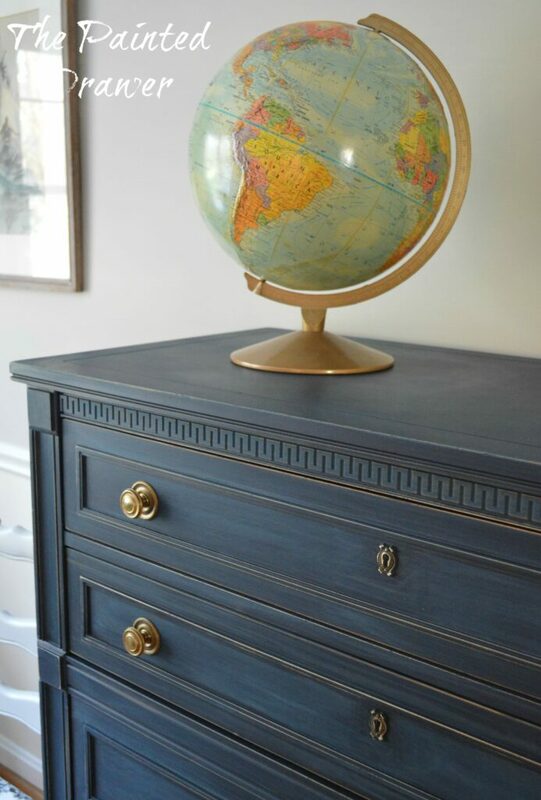 I went with General Finishes milk paint in Coastal Blue. It’s a great navy blue that isn’t too “midnight” for my liking. 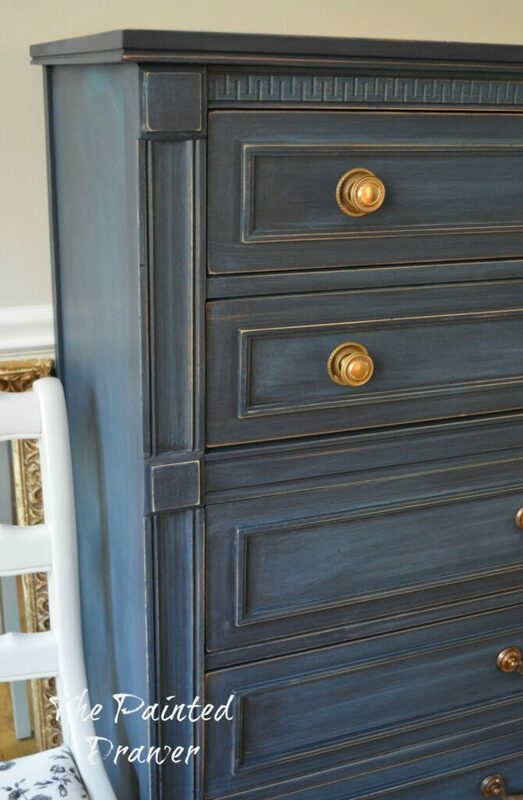 It still is a true blue and after sanding back and distressing, it shows off the dark and light tones to the paint. I love the details on these pieces. 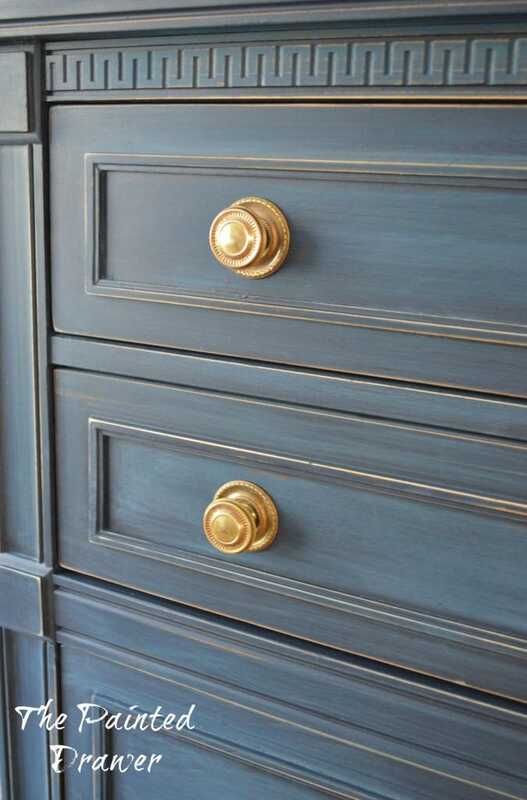 The key trim on top gives interest and the brass hardware adds a pop of gold against the dark blue. I spent awhile cleaning all of the pulls with a mix of baking soda and lemon juice (an easy way to shine that old brass without using harsh chemicals). This set is sturdy on its detailed legs. 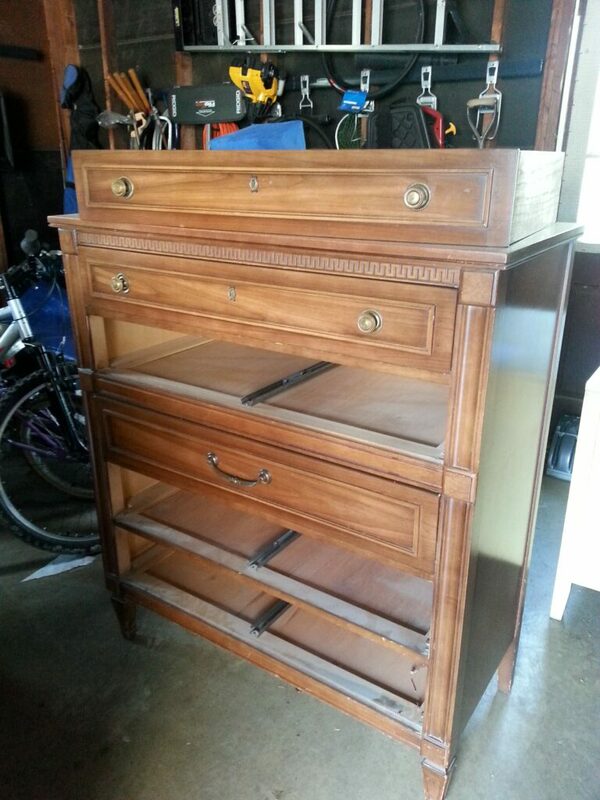 Both pieces are in excellent condition with drawers that glide open and close easily. One drawer has partitions, which I tend to love. I’m also partial to the keyhole drawers on top. I believe this set has an elegance about it that will make any bedroom proud to call it home! Just listed on Etsy ! this is one of my all time favorites- it’s what is on my kitchen cabinets! love this color! these look fabulous! 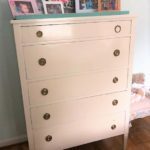 i picked up a very similar dresser yesterday! Love this color, beautiful work. Thank you so much for the chemical free tip on the pulls! These are gorgeous! The dark blue is perfect for them. I painted a sideboard that was a very similar style in MMS Artissimo several months ago and they look like they could be a set. Thanks for the tip about cleaning the hardware. I’m going to try that on my next batch. These turned out gorgeous!!! I even want them. This blue is perfect!! It’s a shame I am not closer to you…this is my FAVORITE color and these are gorgeous!!! LOVE! Could you tell me what you used as a topcoat? 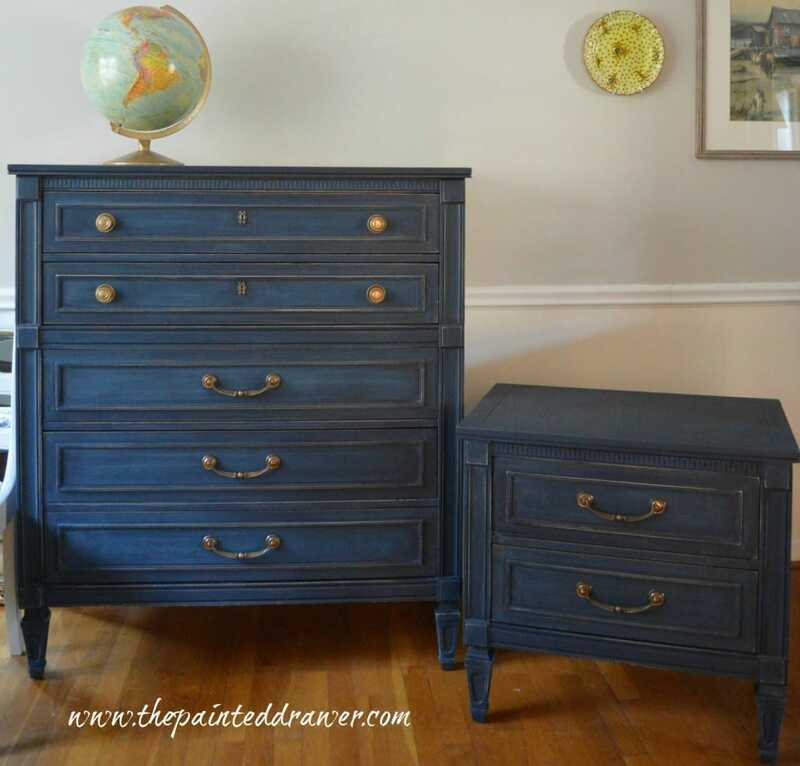 These 2 pieces turned out great – I love the shade of blue! 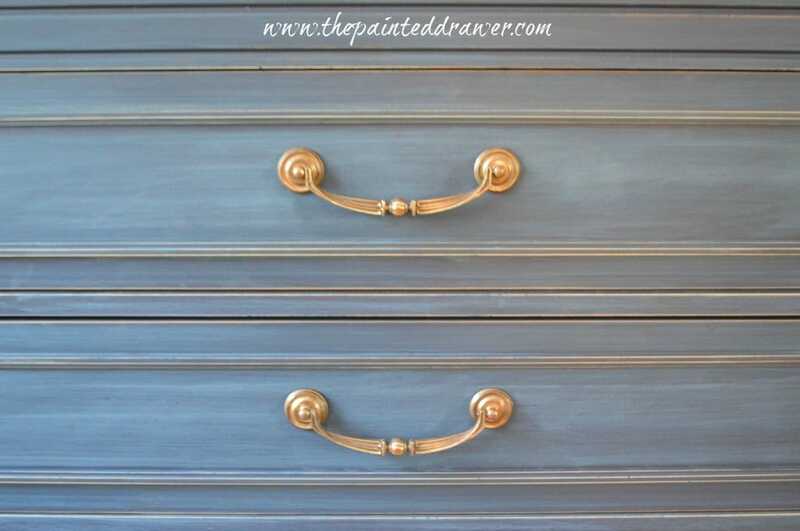 Yes, this paint would be an excellent choice for kitchen cabinets. General Finishes also sells amazing water based top coats that I would recommend for a durable finish. Here is a link to their website and the page you would need…http://generalfinishes.com/retail-products/water-base-top-coats-sanding-sealers Good luck with your project! 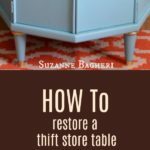 Totally awesome – love the style of the furniture and that gorgeous color! 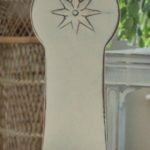 Suzanne, When you say ‘sanded back’ are you talking about distressing the edges and high points or an overall sanding of the piece after painting? What grit do you use for this? Hi Jeannette, I actually used a 220 grit sandpaper and a fine sanding sponge. I sanded over the entire piece and then used the same sanding paper on the edges of the drawers and corners of the piece to distress those areas back. Good luck with your project! What gorgeous furniture!! That blue is stunning. This is BEAUTIFUL! I think I found the color for that armoire that I have been wanting to paint for so long! Thanks for sharing! Hi there! I love your work and this piece is especially beautiful. 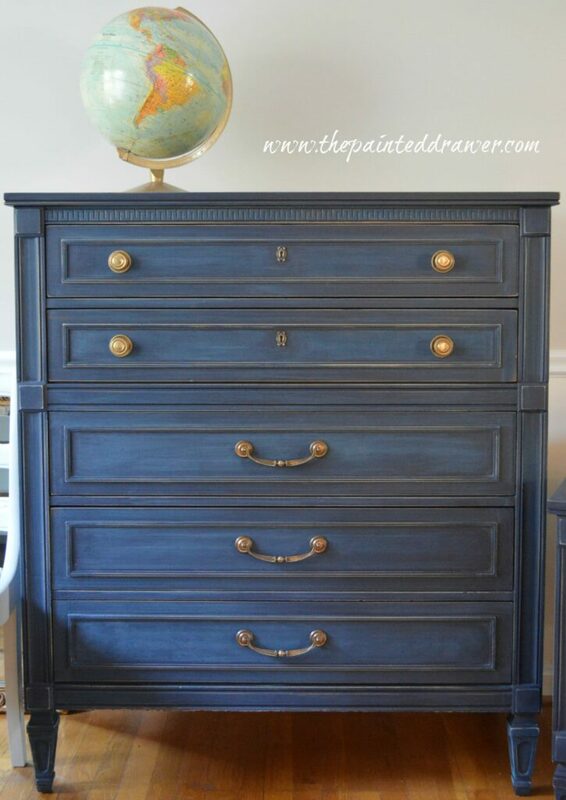 I was wondering if you could share how you achieve the variation in color that is on the surface of the dresser? 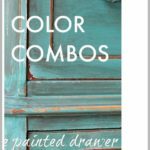 I have used this color of paint before, and it never had that much dimension! Instead, it looked like a flat navy blue. Any advice would be greatly appreciated! Thank you! Hi Ashley, thank you so much. I was able to get the variation of color by using a fine sanding sponge on the paint. I just sanded back in places and that created the lighter/darker effect. Thanks! Love, love, love! What did you use to paint the hardware? Thank you! Hi Mary, I actually just polished up the brass – no paint! Thanks! Hi Suzanne! I love your work!! I wondered if you wouldn’t mind answering a few questions. 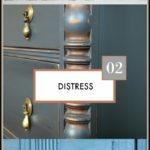 I am very new to furniture painting, but I want to get started. How did you get started doing this? Did you take any classes? Read up on it? Or just wing it! And on average, how long does it take to finish a piece, from start to finish??? Oh, and do you work in a shop, garage, or home, and do you need a lot of ventilation. Thank you so much!! I love your site! 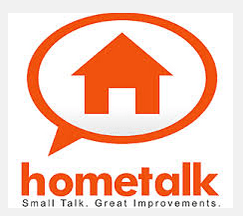 Hi Lynne, I actually have always painted and since I became a homeowner in my late twenties have painted many rooms! 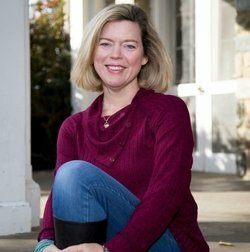 It was when my youngest was full time in school that I began thinking of a business and since I love paint, it just kind of evolved. 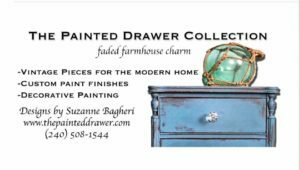 I started my actual business four years ago (when chalk paint was only just appearing on the scene) and used to paint with latex. I have never taken a class and just have fun with it. It depends on the piece but a large sideboard could take 5 days and a little table could be done in a few hours. Depends on the paint/technique. I work at home in my garage and office space and yes, I do need ventilation. The door to the outside is typically open. Thanks and best of luck! 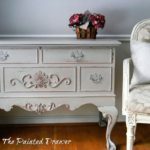 I absolutely love these dressers! What type of topcoat did you put on these pieces? Hi Lorraine, I didn’t deal these but I would suggest General Finishes Flat Out Flat topcoat. Thanks so much!